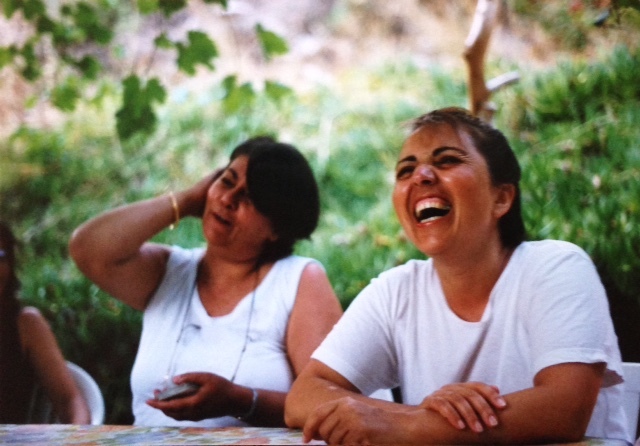 When I was 15 and Saba was nearly 12, my mom started taking us to the Mediterranean coast. We would be visiting family in Turkey for some wonderful amount of time, and then we would don our REI backpacks and make for the South. The journey started with a 12 hour bus ride in the middle of the night through perilous cliff-side roads. Once, I remember waking up around 1 a.m. in a panic, the bus having jerked wildly and suddenly to the left. I looked around, everyone was sleeping. Everyone aside from the bus driver and his skipper, who crouched beside him attentively, eyes glued to the road while his boss smoked cigarettes frantically and gesticulated wildly while telling what appeared to be a story of life or death. I looked past my sleeping sister and the window her head was leaning and bobbing against dramatically with every bump in the road and down to the Sea below. It was very dark. And the Sea was darker, just barely illuminated by the crescent Moon. I had the distinct feeling that I might die and while I was terrified, I wanted not to yell out “for God’s sake, man, slow down!” but to just close my eyes and wish for the best. Things worked out. Another time and another year, I remember the bus stopping at a rest area in some indistinct town, also in the middle of the night. We disembarked, sluggish and mildly confused as to time and place into a scene so beautiful that I thought first, of God. I had thought that we were on a highway, like a California highway, an intense structure separate and apart from its environment. A highway like “this is me, Nature, move out of my way.” But I stepped out of the bus and nearly into the Sea, which lapped, ever so gently, against a shore of tiny rocks, maybe 3 feet from the edge of my toes. I looked around. We were surrounded by mountains to the left, to the right and behind us. But straight ahead was the wide open Aegean, brightly glimmering in the night of a Moon so full she looked ready to birth a smaller version of herself. And while I could see the shuffling of 30 pairs of feet toward a sleepy truck stop diner just a stone’s throw away, I heard nothing. The night was quiet. Almost, science-fiction quiet. I stood transfixed by the beauty of the Planet, tearing up with gratitude. Anyway, the bus rides were really just the beginning of the journey South. We would get off in a town, a fairly large coastal city, and meet up with two of my mom’s best girlfriends, her former college roommates and lifetime BFFs. Together, we would hit fruit stalls and food stands and buy about 30 cantaloupes, a grip of granola, dried fruit and nuts and cookies euphemistically called Digestives. Next, we would stand by the side of the road with our provisions until a man named Ramazan would pick us up in taxi. My mom and her friends knew Ramazan. He had picked them up in this same town 30 years ago when they were college students on spring break. They had kept his number in case they came back 30 years later and needed a taxi. Which, in fact, they did. Ramazan was in his mid-50s. He had deep laugh lines, greying hair and skin like he’d enjoyed most of his life in the fullness of the Sun. He packed our melons, granola and such into the trunk of his car. He tied our bags up to the roof. He drove unselfconsciously. To the left of us was a wall of rocky Mountain and to the right our dirt road ended casually in a dramatic drop 100+ feet down to the Sea. No barriers, guard rails, just a leap of faith on our part, on Ramazan. Ramazan was like an aging version of your fun uncle, the one that was cool 30 years ago, who wore LA Gear and drove a red sports car and had a waterbed. He talked the entire hour and a half to our destination. He had 30 years of stories to tell and his passengers kept getting distracted with their “safety” and “danger” and kept insisting that he stop making eye contact with those in the backseat and instead to keep his eyes “on the road.” He was jolly and sarcastic and laughed loudest at his own jokes. He dropped us off at a small structure where we were greeted by a local villager who urged us to sit, sit, sit, in the 85+ degree of the shade. A short while later, we were joined by a young man riding a donkey. He managed to strap all of our melons and provisions onto the back of the gentle creature and, with a big smile, said it was time to go. I don’t remember being tired or cranky or impatient during these journeys. The next step seemed even more interesting than the last and so Saba and I plugged along with everyone else, asking few questions, content to just listen to our mom and her girlfriends happily chatter along at full speed while we exchanged knowing glances and smiles at things only we found curious. The boy and his donkey led us, with our heavy backpacks and inappropriate shoes, down the mountain for an hour and a half descent. And then finally, we were there, at a campsite along the edge of the woods and steps from the smooth small stones of the Mediterranean shore. We slept in canvas tents, we lit candles for light, we ate food that grew there and bread that was baked fresh daily, we showered under the stars, we tolerated the mosquitoes, we cooled ourselves on a raised wooden platform covered in pillows and shaded by grape leaves, we played with kittens, we played cards, we read books and read books and read books, we followed a German up the Mountain to a waterfall and jumped into freezing spring water, we played with frogs, we got stranded in our swimsuits on a hot shade-less beach and got rescued by a local fisherfamily with 5 daughters (the 5th one was named Yeter, or Enough) who gave us tomatoes from their garden and fresh feta cheese, and we swam and dived and snorkeled and floated and boated and swam and swam and swam in the deep blue of the Mediterranean. All of this, our mom did for us. With her toes in the rocky sand, cutting melons in half and filling them with granola for our lunch, our mom gave us her love for the planet, her country and the Sea. I laugh like her—mouth wide-open, all teeth and gums, head back, a hand slamming boisterously against the nearest thing. It’s the most beautiful thing I’ve ever seen.